Thursday, 12:30 a.m. - 3:00 p.m. Symposium speakers will be invited by the local planning committee. A Festschrift is literally a "celebratory writing" showcasing the work of the honored academic's close colleagues and students. A Festschrift is one way to honor someone in academia that is not just retrospective but also prospective and as such acts as a continued call to work, and inspiration to others. 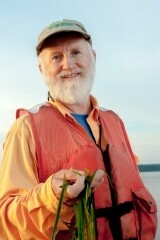 Dr. Fred Short is a marine scientist at UNH and a long time NEERS member. Dr. Short has advanced the field of seagrass ecology and through his work, provided inspiration to many. After completing his PhD at the University of Alaska in 1981, Fred came to UNH where he still works at the UNH Jackson Estuarine Laboratory (JEL). At JEL Dr. Short studies seagrass off the dock in Great Bay and as far afield as the Phillippines, and everywhere in between. Fred co-founded and directs SeagrassNet.Org a worldwide seagrass monitoring program with 138 sites in 35 counties including 7 sites in New England. His recent work includes a study of the temporal variation in intertidal seagrass in China, genetics of the seagrass Halophila in Korea and eelgrass and macroalgae mapping using hyperspectral imagery in New Hampshire. Dr. Short has supervised over 18 students throughout the years. Several of his former students and close collaborators are looking forward to coming together to present our work on seagrasses and beyond, all of which reflects on our mentor, Dr. Fred Short.